Brothers, same alcoholic dad, different outcome?! – Being a COA is a thing! My older brother, on the outside at least, had done ok in life and didn’t seem to share the same issues that I had, despite being raised ‘exactly the same’. In my eyes, this had always made any argument I may have wanted to raise about the way I had turned out being a direct result of my upbringing, completely flawed. We were raised in the exact same environment, by the same people and showed an equal amount of love and tolerance and all other types of emotions we receive from those that bring us up through love. So I was ‘clever enough‘ to not use this as an argument or a need to seek help, and instead I pretended I was ok. In fact, I played the opposite to what I felt inside. I convinced a lot of people, including often myself with this kind of statement but the truth was, I was dying inside and I had no idea why. But the reason it couldn’t have been my upbringing was because otherwise me and my older brother, and my younger one too, would have turned out practically the same. Well it turns out I was wrong! I was wrong, because my basic logic of which I had applied to come to the conclusions I had, had been the real thing that was flawed. Alcoholism is not as simple as that. Until I found Nacoa, I had no idea that people within a ‘troubled family’, or even a healthy family under stress, can tend to take on different roles. 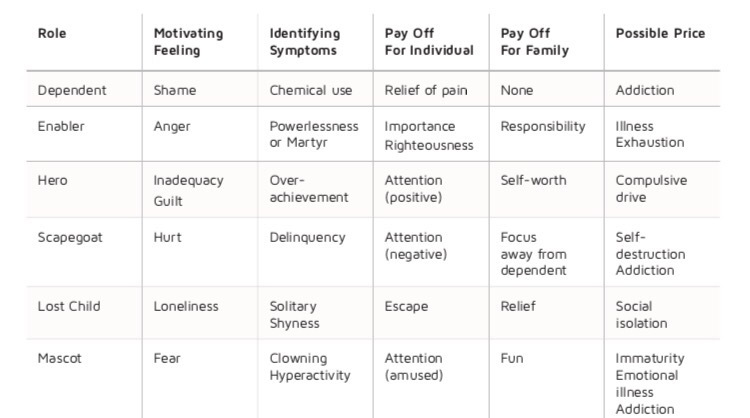 With families dealing with alcoholism in particular these roles are usually more fixed and played with more intensity, compulsion, and delusion. This role-playing is not a calculated behaviour but happens subconsciously. I had no idea it was happening and it prevented honesty, especially with myself, even away from the home. Much like the lie I took into adult life that ‘I had taken it all on the chin’. The table above was adapted by Nacoa, with permission, from the work of Sharon Wegscheider Cruse. It shows the different roles that children play within the family. It is, of course, for guidance only, and each childs personalities and genetic traits have to be taken into account. Some children can take on more than one role, in the case of an only child they can often try to take on all roles, and roles can change when a family circumstance changes, such as the eldest child moving out. Now, I’m not an expert, and only have my experience, but looking at this chart alone I can tell you, without doubt that I was the mascot. Working across the table, my motivating feeling was always fear. I can remember spending most of my life making decisions and choices in an attempt to prevent or avoid situations that often didn’t even happen. It was tiresome, extremely tiresome. I’ve mentioned before in ‘I need your love’ about just how much my life was controlled by a need for gratification from others. My hyperactivity and constant clowning around were an obvious symptom of me as a family mascot. My pay off was clearly the attention I received, and that was a feeling of self-worth, however hollow that actually was. My family received their fun from my antics and I found my place in the world there. I guess I’m pretty text-book in this, because I paid all the possible prices. Emotional illness, immaturity, and addiction. Yep I bagged them all, and although understanding the clear line that I’ve followed didn’t simply take all that away for me, it did allow me to give myself a break, and realise how differences in siblings reactions can come about. It helped me realise that I’m not just defective, a ‘bad egg‘, but that if there was a process that happened to get me tangled up like I did, then there can be a process to untangle me! If only I had of known this sooner. That confusion I lived with for so long could have been eased. Perhaps more importantly, I may have been easier convinced that a solution was possible. I carried my ‘mascot‘ behaviour into adulthood. It meant that I felt I had to be the funny guy ALL the time. I realise now that this is where another contradiction I had in my life came from. I never understood how I could be so popular and liked by so many people, and yet hate myself. This was the mascot in me. It meant that I absolutely had to bury and suppress ALL my negative emotions, because I felt totally unloved unless I was making people laugh and being centre of attention! I loved meeting new people because of all the attention there was to get, but struggled as relationships moved forward and my comedic value began to wear off. Unless I was the mascot, and the I mean the main mascot, I was simply lost in life. For me, this is just another thing that I should have known about when I was younger. I know grades are important at school, but I would have given up any of my grades at school for this kind of knowledge. Maybe you’ve looked at the table above and can relate to one or more of the roles? I don’t have any experience with any of them from my point of view, so I can’t write in-depth about them, but maybe people would like to comment below if they do, or contact us with a post of their own? My Alcoholic father struggled to remember our names so we became numbers. Eldest was called number 1 daughter. Next in age a son but he was labelled number 2 son. The 3rd child became number 1 son a deliberate dig as our number reflected our popularity with him. I was last ! Number 2 daughter. Although I have always been the first to be contacted when something messy happens ! So using the chart in your well observed blog. Role of dependent went to number 2 son started heroin addiction at 18 died aged 60 amazingly. Role of hero went to number 1 daughter . she also mothered our mascot number 1 son who in time , thanks to her support, also became a hero. I became and still am the scapegoat , lost child and enabler. Still struggling to recover from a lifetime of fulfilling these roles ! Thanks for sharing and so relatable! Thanks for another deeply insightful post Josh. I think the sibling link is so interesting and it never fails to amaze me how differently they sometimes seem to play out their roles. Some cope, some shine, others look like they’re coping but inside they’re absolutely all over the place. Even more reason for this subject to have heightened awareness so that people who are not affected by this sort of household can try and have some empathy and understanding of what they might be going through. I’ve recently discovered NACOA and I’m reading a lot of materials around being a child of alcoholics which has been very eye opening for me! I am sort of in the process of deconstructing & reconstructing my childhood & who am I or think I am as a result of this. 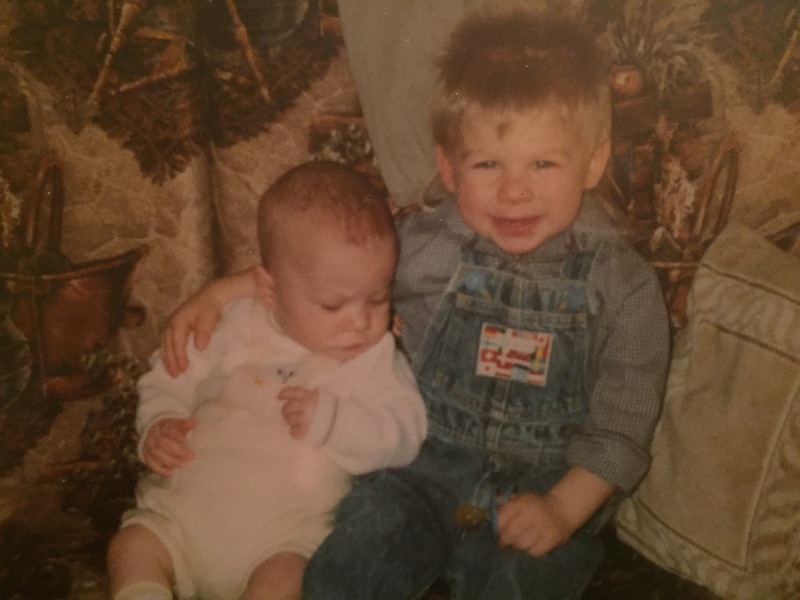 I have 2 brothers & 1 sister and even though we bond over our shared experiences growing up with both parents as alcoholics we do each have a slightly different perspective on it & shapes how we view our mother now and the relationship with her (our father is dead and my brothers are much closer with our mum than my sister and I are). One book I am reading cautioned about believing that your siblings will feel the same way as you about things & this really resonated with me. Different people had to play different roles & also have a different recollection of events. I’m feeling positive about being able to identify with materials here and on other pages – I shared one article with my sister that I found reassuring & explained a lot for me but she was bemused & slightly confused by it (although it did resonate with her). Through therapy I’ve really begun to understand myself which I think is why the article was positive for me – but my sister doesn’t have the same context so when she read the article she found that it was pulling her back into thinking about something she wasn’t in the frame of mind for. It was a lesson for me in being careful & understanding with your siblings in respecting their perspective. I’m really glad you are beginning to find perspective. I can relate to a lot of what you say and I have myself felt bemused by my siblings reactions to different things. I wanted to show that there’s reasons behind this and that in our own ways we are all right and justified in our own feelings.